9:00PM EDT UPDATE: Matthew continues to intensify in the Southern Caribbean with the 8pm EDT advisory showing the storm with winds of 150 MPH and pressure at 940 millibars (MB). The system is nearly stationary near a critical turning point adding tremendous unpredictability to its path. Everyone in the storm's potential path are advised to prepare with Hurricane warnings issued for Haiti and Jamaica. Hurricane Matthew's path is further uncertain due to mechanical issues of the US Air Force Hurricane Hunters reconnaissance aircraft preventing a full update during the 8pm EDT advisory. Additionally, the National Hurricane Center's satellite and radar systems over the Caribbean are suffering technical issues and have been down for nearly one hour. Despite this lag, those in the Caribbean should prepare. UPDATE: The forecast track has Matthew splitting between Jamaica and Haiti before taking a Northwestern turn into the East Coast of the United States after the tropical system made a full 360 degree circle during a major intensification phase. As of the latest advisory by the National Hurricane Center at 5PM EDT, Hurricane Matthew has reintensified with winds upgraded to 150 MPH and pressure dropping to 940 millibars (MB) with the eye wobbling altering the forecast path as a result of the intensification phase. On Wednesday, Hurricane Matthew became the 13th named tropical cyclone for the 2016 Atlantic Hurricane season defying historical norms developing in a high-intensity wind shear environment facing headwinds of 30MPH and forming below the 15 degree north latitude marker – an area traditionally too close to the equator to allow the requisite spin for tropical formation and development. As of the latest advisory by the National Hurricane Center at 2PM EDT the storm packed maximum winds downgraded to 140MPH, but despite a reduction in the system's wind strength it increased in relative intensity with pressure dropping to 943 millibars (MB). The system is also currently defying the tracking pattern moving southward at 2 MPH according to Hurricane Hunter reconnaissance jets. Despite the non-conducive environment for tropical development, the National Hurricane Center based in Miami, Florida could see that now Hurricane Matthew was an unusually strong tropical wave that appeared to be strengthening and predicted the storm would be a minor hurricane with winds of 80MPH by Friday – but Matthew doubled expectations in all the worst ways intensifying rapidly to 160MPH as of the 11PM EDT advisory on Friday Night. As a meteorological marvel, Matthew is profound becoming the first Category 5 hurricane in the Atlantic Ocean in 9 years – the last being Hurricane Felix in 2007 – with only two Atlantic tropical cyclones having seen intensification levels comparable to Matthew over a 24-hour period – Hurricanes Wilma and Felix respectively. Hurricane Matthew is also the lowest latitude category 5 hurricane on record in the Atlantic Ocean lending to the novelty of the powerful system. While onlookers may think of Hurricane Matthew as a weather wonder, in the next 48 hours it will also be a mass casualty event whether it maintains its current path towards Kingston, Jamaica or shifts slightly to the East to impact an even more vulnerable Haiti before slamming into Eastern Cuba. Historically, a hurricane has never taken a southern path for a direct blow to either Jamaica or Haiti with storms traditionally sliding into the islands from a westward path with the deadly storm surge and wave action blunted by islands, but with Matthew the island nations now face the specter of a potentially catastrophic 30 foot + storm surge along with, by some model estimations, 160 MPH winds at landfall. The Hurricane Weather Research and Forecast system (HWRF), commonly the most accurate in predicting the intensity of the rare cadre of tropical cyclones that have undergone what is known as “rapid intensification” or RI predicts wind strength of 155MPH to 160 MPH upon impact with the islands. 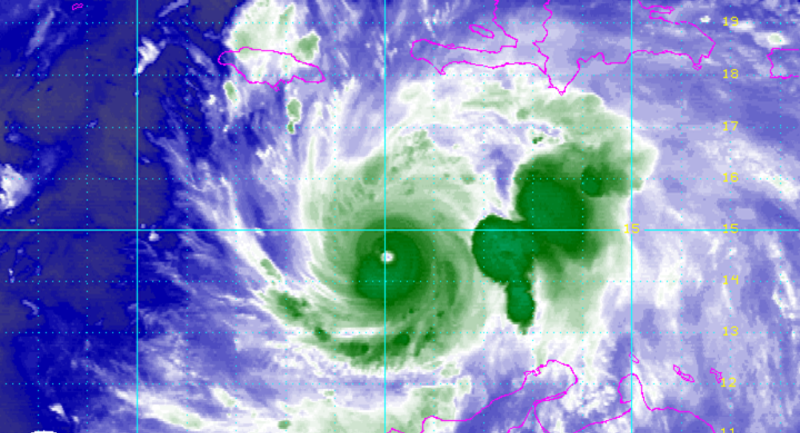 Officially, the National Hurricane Center is predicting that Matthew will undergo a substantial weakening over the next 48 hours due to wind shear and system re-organization with forecast wind speeds of 125MPH at the time of impact with Jamaica or Haiti – the latter only if it makes its northward turn more sharply and slightly ahead of schedule – based on a composite of hurricane intensity models. Unfortunately, there are several factors that are working in favor of Hurricane Matthew that suggests secondary intensification of the system is likely in the next 24-48 hours. As Matthew treks off towards the north it will face more favorable environmental conditions capturing more of the planetary spin enabling the system’s large tail end convection to tighten around the center of circulation while the system is expected to face less dry air and wind shear that can negatively impact the storm. Under ordinary circumstances, the environment Matthew is entering is much more conducive for rapid intensification than its current location. However, satellite imagery and reconnaissance flights by the US Air Force’s “hurricane hunter” aircraft show that the system is currently weakening with its circulation and eye wall appearing more ragged. ​For the sake of adequate preparation for the worst, it should be cautioned that this may be an illusion as Hurricane Matthew’s pressure has remained relatively constant while winds have fallen consistent with an eyewall redevelopment cycle (ERWC) wherein the winds taper slightly in a major hurricane for a short period of time while the tropical cyclone is reorganizing before quickly popping back up in strength. In weather geek jargon, predicting the worst is maligned as “wishcasting” while forecasting below strength levels is blasted as “downcasting.” Given that the islands of Jamaica and Haiti had less than the critical 72 hours to prepare for a major, potentially catastrophic, hurricane based on the major error in initial forecast models for intensity – Jamaica and Haiti should both be preparing for a Category 5 event. Where is Hurricane Matthew Going? There are two leading computer models for forecasting the location of a hurricane – America’s GFS model and the European ECMWF model – with the European model vastly outperforming the US model in predicting tropical cyclones in recent years. The European model has struggled thus far in predicting the path of Matthew with its potential “solutions” mixed with 5% rushing into the Gulf of Mexico, deemed to be exceedingly unlikely, about 30% into Jamaica and then into the US Eastern Seaboard, and approximately 65% taking a harder northern turn directly into Haiti and then floating out to sea. The GFS model, which has more accurately predicted the storm thus far has edged a little towards the east in recent runs, but continues to have Jamaica in its crosshairs with some lower potential for the storm to avoid direct collision with both land masses riding between Jamaica and Haiti – given the storm’s size and that the majority of the storm’s power is typically in the northwest eyewall quadrant this scenario may be worse in terms of loss of life with impacts similar to a direct hit on Haiti. ​The major steering patterns for the hurricane are an upper-level trough, or low pressure system, that directs winds in a counter clockwise direction and a high pressure ridge over the Atlantic Ocean that steers winds in a clockwise direction. These two competing steering currents direct the storm like a boat in a river in the stream between the two. The big question that remains in terms of steering is whether the Atlantic ridge of high pressure will remain strong steering Hurricane Matthew into Jamaica and then the US Eastern Seaboard or whether it will eventually give way to the low pressure system pushing the storm into Haiti and then out to sea. Historically for this time of year the low pressure trough would win the battle nudging the high-pressure ridge to the East steering the tropical cyclone out to sea, but the ridge has proven stronger than previous forecasts and directional models have underestimated the power of the Atlantic high pressure throughout this hurricane season due possibly to the unprecedentedly hot Atlantic Ocean waters. The best forecast is open-ended – everybody in Jamaica, Haiti, and the US Eastern Seaboard from Florida on up to New York City should watch this tropical system very carefully throughout the weekend.